Taken from second volume of “Den Nieuwen Spieghel der Zeevaardt”. Published in Leiden by Lucas Janszn. Wagehenaer, 1596. Coloured by a later hand. Size: 33 x 51 cm. This chart shows the Yorkshire, Durham and Northumberland coastlines from Robin Hood’s Bay to Coquet Island. North is oriented to the right of the page. Part II of the “Spieghel …” was first published in 1585 in Leiden by the Plantijn Press and this example of the map would appear to be a first edition – the title text is only in Dutch and text on the verso is also Dutch. The signature of the engraver, Doetecum, appears at lower right. The North Sea is decorated with sailing ships, sea monsters and an elaborate compass rose, while a scale of miles is also given at lower right. The ” Spieghel der Zeevaardt ” is unique among printed rutters of the sixteenth century, as it was the first to contain maps. Furthermore, it outranks any other rutter of the period with its splendid presentation of charts and text. As such, it stood out as a model for the folio pilot guides of the seventeenth century. 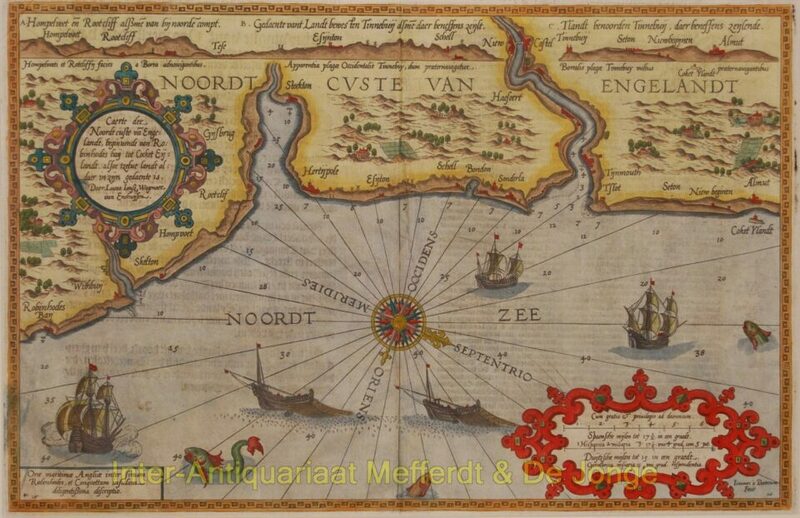 Koeman writes; “Thanks to the unparalleled skill of the engravers Baptist and Ioannes Van Deutecom, the original manuscript maps were transformed into the most beautiful maps of the period. The composition and adornment have greatly contributed to the splendour of what originally were simple sketch charts; the typography of the Plantijn printing house further added to the quality of the book”.